Happy New Year Everyone! 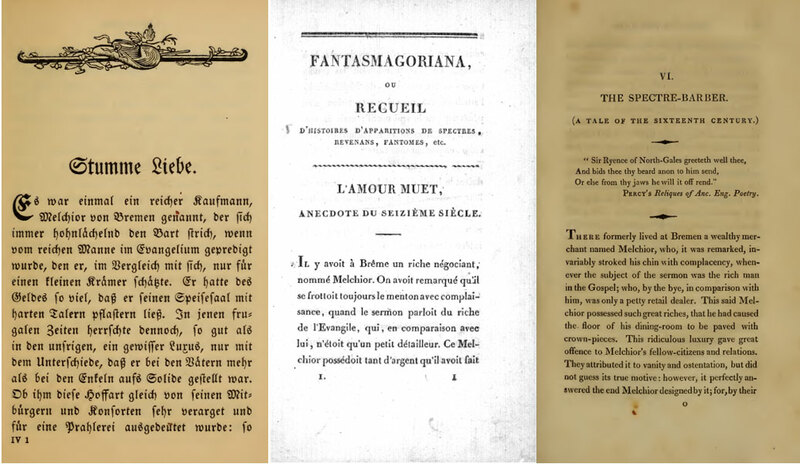 My introductory blog ‘last year’ – actually only a few weeks ago – provided a brief overview of Fantasmagoriana (1812) the text that inspired the famous ghost-storytelling contest at the Villa Diodati. This text was a French translation of the first two volumes of the five-volume German Gespensterbuch (1810–15). In turn, the French edition begot an English translation, Tales of the Dead (1813). Each new translation also featured new content as both the order and inclusion of stories changed remarkably. 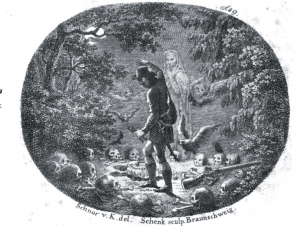 By the time the ghost stories were translated into English, Tales of the Dead contained only three of the original twelve ghost stories in Gespensterbuch. These categories should aid in disentangling the variant editions and allow for a focus on the unique elements of these stories and their possible influence on Mary Shelley. The first story in Fantasmagoriana is ‘L’Amour muet’. In Tales of the Dead this story closes the volume and is retitled as The Spectre-Barber. The source for Eyriès’s translation was a German story published almost thirty years earlier and is, therefore, not to be found in Apel and Laun’s Gespensterbuch. By the time the Byron–Shelley circle read the French translation this story had already been circulating in print for over thirty years. I’ve not actually viewed a copy of the first printing of Musäus’s story first-hand, but several variant editions are online. The 1909 edition appears to be a reprinting of the eighteenth-century edition. 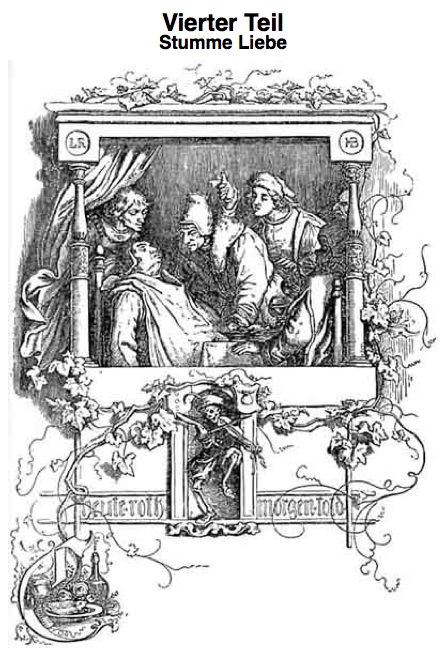 The Projekt Gutenberg-DE version of ‘Stumme Liebe’ reproduces the 25 illustrations from 1842. So, without giving too much away about the plot of ‘Stumme Liebe’ / ‘L’Amour muet’ / ‘The Spectre-Barber’, what is this story about? Our protagonist is Francis, who after the death of his father, Melchior, loses the family fortune. His declining finances force him to rent in a remote part of the city, where from his window he observes the beautiful Meta living opposite his abode. Unable to declare his love due to his financial state, their love is a ‘dumb’ [Stumme, German] or silent [muet, French] love. In efforts to improve his situation and marry Meta, Francis travels from Bremen to collect on former debts owed to his father. In one episode of his travels he is forced to overnight in a haunted castle. Here he encounters a ghost who completely shaves off all his hair: including his eyebrows! Francis then returns the act and shaves the ghost completely bald. This breaks a spell and sets the ‘spectre-barber’ free to eternal rest. The ghost provides Francis with obscure instructions leading him indirectly to the restoration of his father’s financial wealth. He returns to Bremen and marries Meta. This is the curtailed plot of Utterson’s ‘The Spectre-Barber’. Influence of ‘L’Amour muet’ on Shelley’s Frankenstein? The main love-plot of the story at the expense of lengthy ghost-plots may explain why ‘L’AmourmMuet’ is overlooked as a possible influence on Frankenstein. In the movie Gothic, for example, Mary Shelley opens up Fantasmagoriana, and cries out ‘Family Portraits’, inaccurately suggesting this as the first story in the volume. Night waned upon this talk, and even the witching hour had gone by, before we retired to rest. When I placed my head on the pillow, I did not sleep, nor could I be said to think. […] I saw the hideous phantasm of a man stretched out […] He sleeps; but he is awakened; he opens his eyes; behold the horrid thing stands at his bedside, opening his curtains, and looking on him with yellow, watery, but speculative eyes. I opened mine in terror. Clearly, there are some conventional similarities here, but as we will explore in future blogs, this motif occurs in several of the Fantasmagoriana stories. It is the collective atmosphere of the bedside apparition convention that influenced Mary Shelley and Francis’s terror certainly contributes as one of many. More interestingly is the plot and theme of ‘silent’ love between Francis and Meta. Frankenstein also has a love plot between Victor and Elizabeth. There are some broad plot similarities between Victor and Francis in that they are precluded from expressing their love fully until a quest is successfully fulfilled. Both undergo many journeys with numerous obstacles until it is finally an apparition that plays a decisive role in the outcome of marriage – tragically, as we well know, for Elizabeth in Frankenstein. The theme of isolation through not being able to express oneself to loved ones is evident throughout Frankenstein and the greatest torment for Victor. Through his success in finding financial and social stability, Francis is able to express his love for Meta and overcome his isolation by marrying her. Shelley reverses this theme. It is Victor’s success in creating Life that forges his isolation as a permanent condition that precludes the declaration and expression of his feelings for his loved ones who have become endangered by his discovery. At the end of the novel, Victor has lost everything, which is the starting position of Francis in ‘L’Amour muet’. This reversal may have been a general theme interwoven in Shelley’s plot of Victor and Elizabeth as tragic lovers. My next blog will focus on the second Fantasmagoriana story, ‘Family Portraits’. Shelley herself cited this story as an influence on her novel. We will explore to what degree and detail in a few weeks. See you then.